Deadlocks in SQL Server usually occur when users try to place exclusive locks on each other’s objects. For example, a database user Bob first acquires an exclusive lock on Sales table and then attempts to place an exclusive lock on Orders table. Another database user Joe already has an exclusive lock on Orders table, and he tries to acquire an exclusive lock on Sales table. This creates a deadlock situation because both Bob and Joe processes are waiting for each other’s objects. In SQL Server, the exclusive locks held by users will not clear until one user process completes or times out. Luckily, SQL Server provides a variety of different options to monitor deadlocks. This includes Trace flags 1204 and 1222, SQL Profiler trace events, Extended Events and Event Notifications. Of these options Extended Events are the most efficient, lowest impact method for capturing deadlock information. Extended Events infrastructure is built directly into SQL Server and so can easily be managed with T-SQL. For more information, see SQL Server Extended Events. In this article, we will look at the procedure, to capture deadlocks on SQL Server using Extended Events. Note: For the purpose of this article demo, we will use OUTLANDER database. --Displays the schema information about the lock_deadlock event. For more on the extended events syntax, please refer to CREATE EVENT SESSION (Transact-SQL). Note: For the purpose of this example we are using asynchronous security audit file target. To view information of about supported targets, query the sys.dm_xe_session_targets dynamic management view. as the deadlock victim. Rerun the transaction. When this is the case, an event will be raised and sent the deadlock info to our “package0.asynchronous_file_target” target. Below is the XML for the deadlock, which occurred during our testing. From this XML, we can obtain important information such as lock ID and type, SQL Text, and database id. Extended Events in SQL Server are a powerful, low impact and somewhat complicated real-time event monitoring feature. 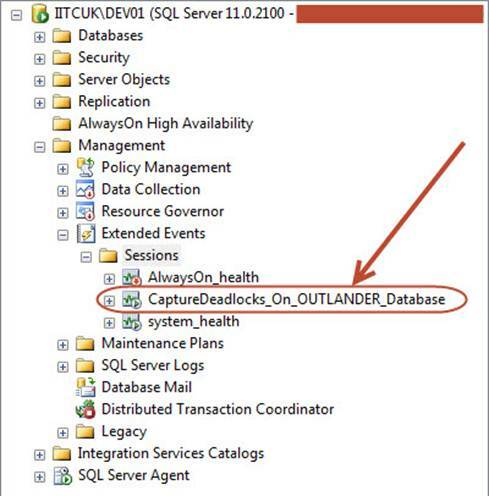 In this article, we have seen how we can use this SQL Server feature to capture deadlocks inside our database in real-time.